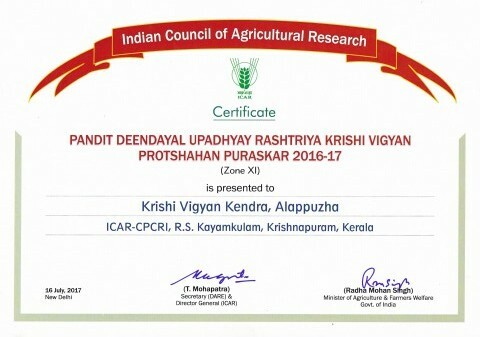 ICAR-KVK-Alappuzha has been awarded the Pandit Deendayal Upadhyay Rashtriya Krishi Vigyan Protshahan Puraskar 2016-17 for Zone XI. The award consisting of a certificate and prize money of Rs.2.25 lakhs was received by Dr.P.Chowdappa,Director,ICAR-CPCRI and Dr.P.Muralidharan,Principal Scientist & Head, ICAR-KVK-Alappuzha at the 89th ICAR Foundation day and Award Ceremony held at National Agricultural Science Complex on 16th July , 2017. 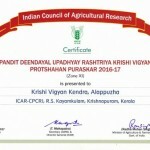 The KVK has been functioning since 2004 as the knowledge and resource centre in the field of Agriculture and allied sciences to impart knowledge, skills and conviction from experience through trainings, on farm testing, front line demonstrations, farmer field schools, method demonstrations etc. 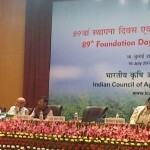 and serving as the venue for ensuring availability of inputs, planting materials, produce and information. 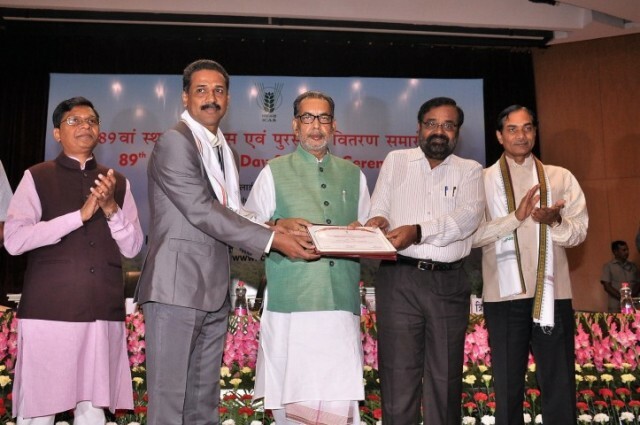 The pioneering efforts made by this KVK in ensuring food and nutrition security for the farmers and improving their income and employment potential have been very well acknowledged by different stakeholders and farmers at large, which enabled the KVK for this achievement.